As of today you can now compress all your photos with the High Quality settings of Google Photos even for photos you have uploaded to Picasa and Google+. That's freeing up your storage greatly. I've got back 10,7GB of storage. Don't be afraid, the algorithm of Google Photos High Quality setting is extraordinary good. I've tested it before, and in almost any case, there is no visible difference. It's magic. You'll can find that settings by visiting photos.google.com on the web, go to settings, and right where you can select between HQ and Original, there is a button below "Recover Storage". It can take some time. After that, enjoy your free storage to use with Gmail or Drive. Does this compress my photos, I uploaded to Google Drive? No, it doesn't. 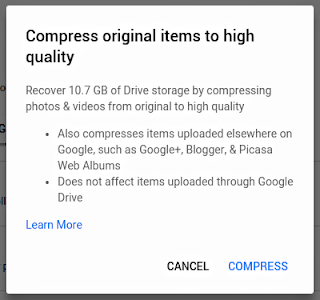 Only Picasa and Google+ photos will be compressed. Everything that counts toward your Photo-Storage, even Blogger.com pictures. Can I go back? No, this is a one way street. But it's really High Quality. But, but, it's not original size Yes it is. Up to 16 Megapixels without changing the size. What they do is compressing your photo with a superior algorithm. Almost no visible change. See for yourself. After that, everything I uploaded will be compressed? You can choose that within the settings. If you set to High-Quality all new photos uplaoded with Google Photos will be stored without counting towards your storage. Unlimited. It's not clear at the moment if this applies to pictures uploaded through blogger etc. too. Does this change the photos on my mobile device? No, it doesn't affect the photos you stored on your smartphone e.g. You do a local backup of your photos on your phone regularly, right? RIGHT? What about my videos? They also getting a special treatment. Videos up to FullHD (1080p) are no longer using your storage either. Update: If I upload new photos to my blog, or with Picasa are they now compressed? Nope. I assume that is intentional, but very irritating. All new photos uplaoded with Picasa or your blogger.com image dialog will count towards your storage. However you can hit that recover button again to recover your storage for those newly uploaded photos, too. Still questions? Let me know, I'll add it here.